"SAND HARBOR IN WINTER ~ LAKE TAHOE" 24 x 48 inch oil painting on a frame-less 2 inch deep cradled hardboard panel with black sides. The original oil painting is available for $5,800.00 from my studio. Prints are available in stretched canvas, acrylic, polished metal and paper. Click on image to see your options. "SAND HARBOR IN WINTER ~ LAKE TAH was created by artist Frank S. Wilson in 2014. This art piece , which is part of the Landscape Oil Paintings portfolio, is a Paintings artwork. The style of this artwork is best described as Fine Art, Realism. The genre portrayed in this piece of art is Landscape. The artwork was created in Oil, Painting. The size of the original art is 24 (inches) H x 48 (inches) W.
Words which artist Frank S. Wilson feels best describe this work of art are: winter at sand harbor lake tahoe, winter, sand harbor, lake tahoe, sierra nevada, nevada, frankwilson, winter art, alpine, pine trees, rocks in water, rocks, clear water, sandy beach, granite boulders, granite boulders at lake tahoe, lake tahoe sand harbor, oil painting of lake tahoe, winter at lake tahoe, lake, frank wilson, mountains, snowcapped mountains, sierra nevada, sierra nevada mountains, alpine, . A full time professional artist since 1971, Frank's formal art education took place at the School of Practical Art and the Art Institute of Boston where he majored in Editorial Illustration and minored in Photography. He continued his fine art education with further studies under Marko Lolo Marchi and Steven Yankopolis. Over the years, the artist has won many awards for his paintings and sculptures. In February 2010 he was awarded First Place and an Honorable Mention for two entries in the Turner Colour Works of Japan International Gouache Painting Competition. In September of 2005 he was awarded by the City of Chico California, the COBA (Chico Outdoor Board Art) Peoples Choice Award and a commission for a large outdoor mural. Twice, by invitation, he exhibited in the New York State Museum, and has also been featured in art galleries in Canada, New England, Virginia, North Carolina and California as well as in Zurich and Geneva, Switzerland. On October 9, 1998 he was a featured artist on ABC's nationally televised "Good Morning America" show. On January 23, 2009 he was a featured artist on CBS Action News on KHSL TV in Chico, California. A prolific painter, Wilson has created over 3,000 original works in oils and watercolors just since 1995 in addition to hundreds of sculptures. Wilson's paintings and sculptures are in private and corporate art collections in dozens of countries on five continents. He also has painted scores of murals and illusions in homes and businesses. The wilds of nature, in all it's diversity, is the common denominator for this multi-talented artist. The hills and mountains in the wilderness areas of Northern New England and Northern California are the inspiration for his widely ranging work in water media. Hiking by the light of the full moon has inspired Frank to create a series of "nocturnal" watercolors. Climbing in the high country, the artist has witnessed the light of dawn and dusk and translated those moments into dramatic paintings. These unique watercolor and gouache paintings capture the magic of a moonlit winter's evening or a mountain sunset. Sunny days or violent storms, clouds play an important role in many of his landscapes. Wilson also paints in oils which he prefers to emphasize the atmospheric quality of mountain vistas and the winding trails he loves to hike. 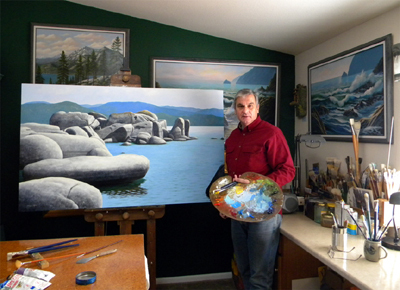 Wilson is known for his "landscape portraits" of well known natural beauty spots and detailed paintings of wildlife. His wildlife art has been exhibited in many of the major Eastern Wildlife Art Shows. Two of his wildlife paintings were published in Canada as limited edition prints of six thousand each which sold out soon after publication. Frank is one of the 54 internationally selected artists showing on Art Studio 54. Frank Wilson has always had a deep appreciation for natural beauty and a reverence for the natural world. His passion is evident in each of his works, whether it be a small gouache study or a large oil painting.